I frequently get asked what exactly a book designer does. Just the other day I spoke with a client whose book is in copyediting. I’ll be getting ready to start work on his interior next week. But I got to thinking about it later. We talk frequently about the need to hire publishing professionals, to get your book properly edited and designed to compete in the marketplace, or, if you’re going to do it yourself, to make sure you understand the conventions and best practices of book production. But there are book designers and book designers. Many cover designers do only covers, that’s their specialty. Some designers do only interiors. There are designers that do covers, websites and marketing collateral. Then there are designers who provide a complete resource for self-publishing authors. When I meet with prospective clients the first time, it’s really the beginning of a relationship. In this relationship we share responsibility for the embodiment of their manuscript in the form of a consumer product. By the time the books roll off the press, I may have been involved in many aspects of the book’s development. 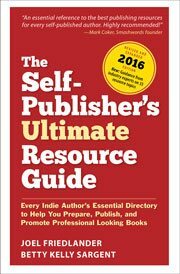 Determine whether the prospective self-publisher can articulate a clear goal for her book and, if not, to help her achieve that. Help the client determine the category, niche, or target market for the book. Assist client in obtaining ISBN, LCCN, SAN and publisher listings if needed. Decide the best printing process to meet the goal and help client select provider. Analyze the formats that will be needed in the finished book. Arrange for copyediting, if the author has not done so already. Set up a production schedule. Hire an illustrator if needed. Clean up text files submitted by author. Create sample interior designs, using a representative chapter and most if not all of the formats needed for the final book. Create sample cover designs demonstrating the different ways the book can be positioned within its category. Work with client to adjust designs to fit their needs and aesthetics. Layout all the pages of the book, correct formatting where needed and adjust the length to the right number of pages. Remind client to finish the copy for the copyright page. Obtain a spine width calculation, cover template and technical specs from client’s book printer. Layout and proof complete flat cover including barcode. Scan photographs if necessary, and adjust photographs for selected printing method, if any are used. Prepare Advance Review Copies (ARC) for marketing and review purposes. Arrange for proofreading and indexing if needed. Advise publisher about her packing, shipping and storage options for offset books. Create reproduction files conforming to printer’s specifications, and coordinate proofing and production with printer. Celebrate every milestone as one step closer to the client’s goal. If It’s a Real Production, Doesn’t That Make Me a Producer? When I looked at this list, I realized why my favorite term for what I do is Book Producer. However, no one has ever called me up saying, “I need a book producer,” so I don’t use it. But that’s what it is, gathering the resources and talent needed to produce the book at hand, and making sure the project runs smoothly, and on budget, to a satisfying conclusion. Keep in mind that nothing in the list of 22 Tasks above describes the biggest part of the designer’s work: creating the typographic container for the author’s work, and doing the actual fitting, pushing, nudging, aligning, sizing and organizing of the content into something that looks the way a “book” should look, that actually enhances the experience of reading. And that, in the end, is really the most satisfying part of what I do. Most of the books we create, even if they are influenced by the fashion of the day, will be around far longer than we will. As a designer sometimes I feel as if I stand between the 500-year traditions of bookmaking on one hand, and the potential hundreds of years some of these books may last on the other.